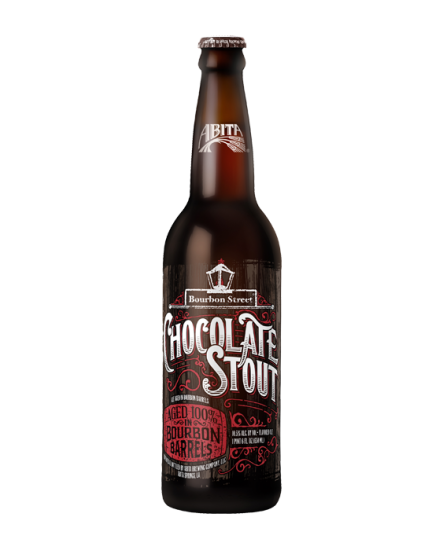 Bourbon Street Chocolate Stout is a stout that has cocoa nibs added and is aged in small batch bourbon barrels. Our Chocolate Stout is brewed with a combination of pale, caramel, chocolate, and roasted malts. The chocolate and roasted malts give the beer its dark color and sweet roasted flavor. After fermentation and aging the beer is transferred into the bourbon barrels and cocoa nibs are added. It is then aged for another 8 weeks to absorb all of the flavors from the barrels and the cocoa nibs. The result is a robust stout that brings out the sweet roasted flavors from the malt, the rich chocolate flavors for the cocoa nibs, and the vanilla and bourbon flavors from the barrels.